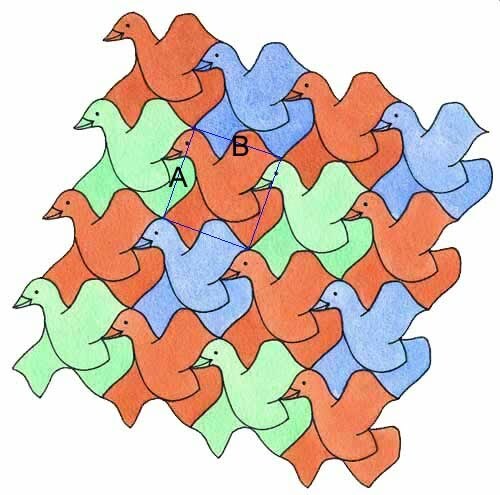 An open question to ask when designing tessellations is to whether it is easier to create a tessellation consisting of one, two, or more motifs. Intuitively, one would assume that it would be easier to create with one motif, rather than two or more. Indeed, I had previously assumed this. However, upon recently reading a thesis and a book concerning this aspect of design, namely Escherization by Craig Kaplan and Designing Tessellations by Jinny Beyer, they conjecture that two motifs may be easier to create than one. This seems somewhat counterintuitive, in that the designing of quality one-motif tessellations is difficult enough as it is. With two, three, or more motifs, it would seem prima facie that these would be more difficult with each increase of the numbers of motifs. Therefore, I now examine this issue to see if their conjectures are germane.
. . . One might guess that because of the need to match two goal shapes simultaneously, dihedral [two motif] Escherization would have a lower success rate than monohedral [one motif] Escherization. I have found that the additional degrees of freedom offered by the splitting edge more than compensate for the added complexity of the problem, and that the dihedral [two motif] objective program performs comparably to or better than the monohedral [one motif] one. However, the above two people’s comments per se should not be awarded equal merit, as they differ in their approach and understanding of tessellation. As can be seen in my book reviews section, in which I reviewed Beyer’s book, I was most critical as regards the quality of her tessellations (designed the ‘traditional’ way, by hand), unfortunately with the majority being essentially worthless. Therefore, as Beyer demonstrably does not understand tessellation, her comments are of less importance, if indeed even worthy of cognizance. Kaplan’s tessellations are much better in quality, albeit still not of an Escher standard. In contrast to the way most people design tessellations, he creates tessellations in a completely different way, with a computer process he calls ‘Escherization’, in which a goal shape, for example a photograph of a real-life dog, of which this then has tessellation operations performed on it to enable this to tessellate. His background is of note, a professor of computer science, in which he is demonstrably more advanced in mathematics than with most of the people in the tessellation field, who mostly come from an artistic background. Therefore, his comments carry more weight per se. Indeed, it was only due to his background that I deigned to examine the issue, as I dismiss Beyer’s views out of hand, for reasons as stated above. I now scrutinise the tessellations of the respective authors, and include Escher’s (despite him not pronouncing on the subject).and my own tessellations as well. Whether due to the inherent difficulty between the two types, there is a noticeable difference in ratio (10:6) between the one- and two-motifs, albeit with such a relatively small sample perhaps not too much should be read into this. No matter, the relevant question is the quality aspect, in that are the one- and two-motifs on an approximate par as to quality? As such, I slightly favour the one-motifs, but the difference is not great. Particularly pleasing is (a) Escher’s Escher Escherized (a one motif, of which incidentally this is aesthetic). Note that there are different factors to consider as regards quality, as both types contain the ‘amputation’ type, a much easier category to achieve, as discussed in Essay **. Another question is to ask whether these are comparable to Escher’s standard. Broadly, in comparison, these are lacking. I see no evidence to back this statement. As can be seen, there is a dramatic falloff of instances with increasing number of motifs. However, this list is open to reservation, as questions of intent arise. For example, one may purposefully search for one- or two-motifs, to the exclusion of one type or the other, and so skew the true difficulty. Escher was probably not concerned with motif numbers per se, at least in the initial years. Also, his early tessellations of 1926 or 1927 can be said to be of an initial probing, being relatively poor in quality, without thought as to the matter, but do not really impact on the analysis, as these are few in number. On later occasions, he purposefully undertook tessellations with more motifs, and so all these factors tend to skew the results. However, as guidance, this still surely must have implications as to inherent difficulty of the numbers of motifs. The chart can be assessed in various ways. Of note is the noticeable difference in numbers between one, two, and three/four motifs. One could also combine one/two motifs and three/four and state that the latter are negligible. Of interest is the disproportionate larger numbers, with tessellations of 12 and 36 motifs, albeit of only one instance of each, and so such large numbers of motifs are of interest due to their infrequency. The examples above, with each succeeding number of motifs, greatly reduce in size, with 82, 49, 3, and 2 for one to four motifs respectively. Extrapolating from this, one would expect that further increases, of 5 and 6-motifs would be even rarer, and anything above this to be unattainable. However, this does not take into account the larger number of motifs, of the 12 and 36 examples. What explains their appearance? In this instance, Escher purposefully set out to compose a tessellation with far more motifs than with his usual one or two. Periodic drawing 70 has 12 motifs, whilst periodic drawing 83 has 36 motifs. Of note is that despite the significant increase, both of these remain of relative quality, albeit one could quibble at some of the motifs of the latter. Also, the latter is not a ‘true’ tessellation, as this 36 patch will not tile, albeit it is built upon tessellation principles, with dual purpose of line in mind. As alluded to above, this is of relative quality, with birds of the same quality as of Escher's one- and two-motif examples. Of note is the type of motif used, birds throughout. The reason for this is that birds make an ideal motif, in that their outlines are ambiguous, as detailed in Essay ** Ambiguity of Outline, and so are ideal for such matters. An equally likely example would have been of 12 fish. More challenging would be 12 motifs of quadrupeds; however, this would be so difficult to accomplish as to be impractical. The explanation for the 36 motifs is of a different nature. Here, the motifs have ‘free reign’, with a mixture of real-life and of a decidedly fanciful or imaginary nature that are decidedly easier to accomplish. Also, the task is made easier in that the border is not of a tessellation line, and so Escher has more leeway here as regards outline. Of interest is the ratio of my own tessellations. However, as much as I would like to include this here, this is not a simple matter. As such, I have tessellations in various forms, due to time constraints, described as of (i) finished work, (ii) semi-neat, and (iii) wireframe. Although ideally I would like to show all these as finished work, I simply do not have the time! Do I include just the finished work (which would probably skew the ratio) or all three categories? Furthermore, my design processes can generate a large number of tiles. For example, below I show a Set of 144 two-motif tessellation. Admittedly although all are distinct, these are, or can be, described as alike. Are all these of the same merit? A casual glance at the site shows relatively few examples, and yet here I have a set of 144 two-motifs! Therefore, I have decided against a formal setting out of the numbers in this instance. Above, I have analysed this with other people in a generalised matter, by the simple process of totalling the tessellations produced. In contrast, for reasons as stated above, I now examine two of my own tessellations, of one- and two-motifs in greater detail, as according to line arrangements. Figure 1a has simplest type of transformation, with an underlying square with two translations (although I could have chosen other symmetries). As can be seen, this has involved two distinct lines, A and B, with each line representing two different aspects either side of the line. Figure 1b, for the sake of clarity, shows a line diagram. 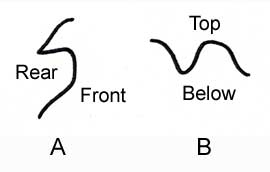 The premise of the argument is that each line, A and B, represents two aspects of the bird, front/rear, and top/below. Two Motifs – Bird and Fish. Figure 2a has an underlying rhombus, again with translation symmetry, in which I split the tile (as Escher did for his two-motif examples) from vertex to vertex to form two motifs. As can be seen, this has involved three distinct lines, A, B, C, with each line now representing three different aspects either side of the line. Figure 2b. 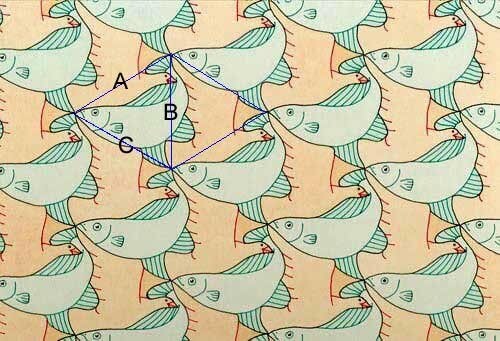 The premise of the argument is that each line, A, B, and C represents two aspects, one side it’s a fish, and the other a bird. As can be seen the, one motif tessellation require 2 refined lines, whilst the two motif tessellation requires 3 refined lines, with all the extra time and effort involved in refinement. Surely the increase of motifs thus makes for a more difficult composition? As Escher tessellation art is difficult to achieve with just minimum amount of lines, I do not see how introducing more and more motifs can make the task any easier. As shown immediately above, the one-motif requires two refined lines, whilst the two-motif requires three refined lines. Naturally, with successive increments, such refinement requires more care and attention to accomplish. What about four, five or more such lines with many motifs? On the argument that more lines offers ‘greater flexibility’, then surely such examples would be common. As can be seen, there are by far more tessellations of one motif, rather than two, and with three or more paling into insignificance. Admittedly, this may be that people don’t actively try for two or more motifs, and so by default there are far more one-motif tessellations of this type. However, the argument is surely germane as a principle that the more motifs, the more difficult it will be. Although of an interesting challenge, I do not consider that the pursuit of large numbers of motifs just for the sake of it is of undue importance. Although it may be thought that such examples would be extremely rare, and so perhaps more worthy, ‘many motif’ examples are not as difficult as one may think. Another example of such a type is by Robert Bogl, who has many examples of this kind. 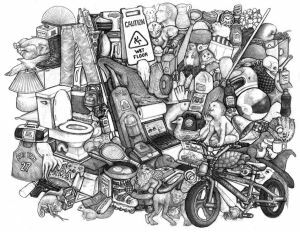 Below is an example titled 'Interlocking Everything', with a variety of both animate and inanimate motifs. Indeed, in a sense his are even more impressive than Escher’s '36 free plane-filling', as he shows more than Escher's two examples. So, I believe that the more motifs in a tessellation, the greater the difficulty as regards both the creation, and the all important quality issue. As I have detailed elsewhere, quality is everything, and the creation of a many motif tessellation, of poor quality motifs, has no place.